They might maintain that Led Zeppelin are the only band that have ever managed to achieve ‘cool band name’ status, but (not so) new kids on the block I Don’t Know How But They Found Me encompass everything you might expect from a band that took their name from a line in Back to the Future. Think futuristic yet nostalgic. A Star Wars/Bowie hybrid that, on paper, sounds outdated and overdone, yet in reality is the most fun you’ll have this side of the ‘80s. Dallon Weekes and Ryan Seaman are no strangers to the music industry, having each played in bands for over a decade and both reaching great levels of success with their respective projects. After the madness that came with playing in Panic! at the Disco and Falling In Reverse, iDKHow was an opportunity for Dallon and Ryan to break away from being associated with such high-profile projects. To reinvent themselves and their sound, and seek approval without using their past achievements as a method of bringing this new project to fruition. It happened in secret. Dallon had been writing an album outside his main job with Panic! and needed a session drummer; having known Ryan for over a decade after playing in the indie-rock band Brobecks together, he seemed the obvious choice. Considering the style and calibre of music that iDKHow have produced, it’s easy to see how the two went from recording together to finalising themselves as a two-piece and playing live shows. The eclectic sounds that Dallon has sampled work perfectly in conjunction with the tones in his voice, conjuring mental images of old school discos and scenes from your favourite ‘80s films. Sonically, it’s carefree and jovial, making it impossible to sit still for even a second once the beat kicks in. In simpler terms: it’s just really bloody fun. One of the biggest signs that they were garnering this attention was when the band played in LA – “an entertainment town, you know, they’ve seen it all – and if you can get people to look up from the bar and turn around, in a town like that, then you know you’re doing something right”. And for a while, that’s how they liked it. Seeing it as “a challenge” to find out if “they would not only pay attention, but grab onto it.” And grab onto it they did, highlighted when iDKHow released the audio video for ‘Do It All The Time’ and watched as, before any promotion, it reached eight million views on YouTube. We might live in a digital world, but iDKHow have proven that traditional ways of not just discovering music but falling in love with it, too, are far from being obsolete. In fact, the band was booked for Reading and Leeds, as well as a small UK headline tour (which they quickly sold out) without any promotion whatsoever. It’s rare to see this kind of impact today, but then iDKHow aren’t exactly like every other band on the scene. This approach felt more organic for the pair, who thrived on being able to focus “more on the art”, but that doesn’t mean their recent decision to sign to Fearless Records has left them feeling any less in control. Instead, the duo simply “have a bigger army now” with which to propel them forward in the future. There are numerous reasons as to why both halves of this electro-pop duo are so loveable, but the two most evident are undoubtedly their integrity and authenticity. With every word spoken, it’s clear that Dallon and Ryan are doing this for all the right reasons, and not just because they refused to exploit the loyalty of fans of their previous bands. Even the decision to sign with Fearless, over and above the other labels bidding to add them to their list of artists, was one made out of dedication to their sound, with “the biggest deciding factor” being “having 100% creative control over the music we make”. It’s reassuring to know that this is the stance the band takes, with so much music today being diluted and filtered through a machine before reaching the fans and meaning we never really get to know the bands we love. Luckily for iDKHow, Fearless are “totally on board” in regards to the music going straight from their heads to the fans’ ears; a perfect partnership for everyone involved. 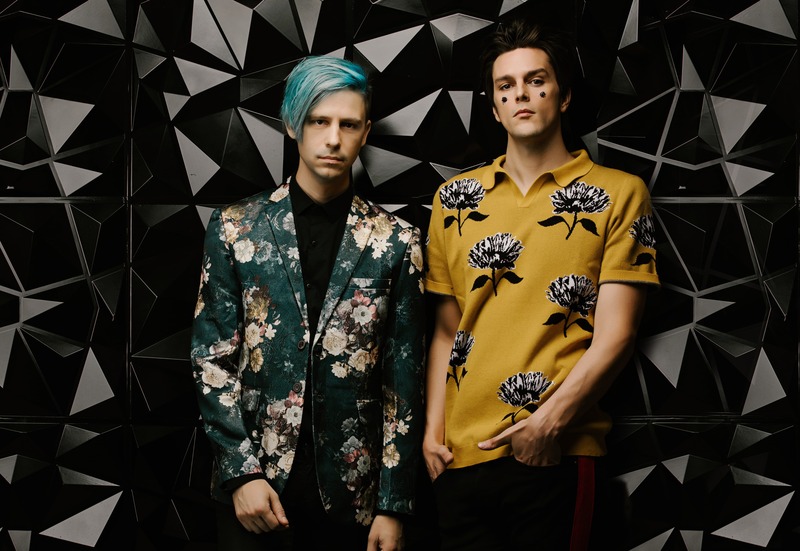 iDKHow’s futuristic synth-pop sound might come as a surprise considering their label mates include bands such as August Burns Red and The Color Morale – two far heavier, guitar driven bands – but as the lines that define genres blur, fans are no longer interested in being placed in a box. Gone are the days of being able to accurately determine someone’s music taste based on their choice of attire. Thanks to streaming services that allow us to explore a more diverse collection of music than ever before, we’re becoming less confined by labels, and as a result, bands are exploring their new-found freedom, too. With that in mind, the idea of iDKHow supporting up and coming pop punk kings Waterparks is far less of a surprise than it might have been ten, or even five years ago. For Dallon and Ryan, “it was kind of interesting because, like, our music is so different, but they seem like really nice dudes and they’re killing it right now, so it made sense”. The idea that two bands can’t tour together because they sound different is, to Dallon, “a stupid rule!”, and one that they refuse to abide by. With music fans increasingly listening to artists of all genres, iDKHow are smart to have taken this approach to touring. They’re “not picky”, and are evidently excited for any opportunity to hit the road and “get in front of audiences that probably wouldn’t have checked us out otherwise.” And with the absolute joy that fills you up when any one of their tracks plays, there’s no doubt that this November tour with Waterparks is going to see them gaining even more traction across the US. As for the UK, we have one more opportunity to catch them this side of the pond as, following the release of their much anticipated EP, they support Deaf Havana at their one-off headline show this December at the iconic Brixton Academy. ‘1981 Extended Play’ will be released on November 9, so you’ll have to wait a little while longer to get your full fix of this wonderfully odd new band. For now, though, you can fill the time by watching the very weird video for ‘Do It All The Time’, and make the most of New Music Friday by listening to the brand new track Bleed Magic – released today.